Professor Kevin Parker was an invited speaker at the American Institute of Ultrasound in Medicine conference in Orlando, FL. Parker's talk was titled "Rapid vs. Gradual Changes in Tissue Viscoelastic Properties." 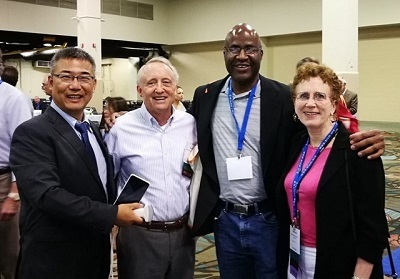 Photo above, left to right: Dr. Clark Wu (Lonshine Technologies Co.), Prof. Kevin Parker, Prof. Marvin Doyley (University of Rochester, Department of Electrical and Computer Engineering), Dr. Deborah Rubens (University of Rochester Medical Center, Department of Imaging Sciences. Dr. Wu demonstrates his company’s newest product, a handheld ultrasound scanner that has cell phone transmit capabilities for images. 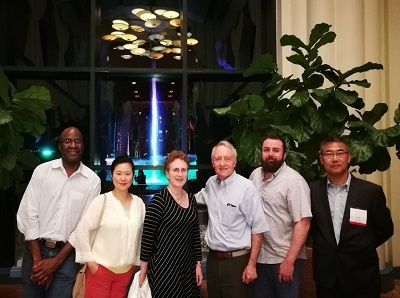 Photo above, left to right: Prof. Marvin Doyley, Dr. Maggie Zhang (University of Washington), Dr. Deborah Rubens, Prof. Kevin Parker, Prof. Ken Hoyt (University of Texas Southwestern Medical Center), and Dr. Clark Wu (left to right) gather at the AIUM Annual Convention, Orlando, 2017. Clark Wu and Maggie Zhang are both former UR PhD students supervised by Prof. Parker; Ken Hoyt was a former PostDoc in Prof. Parker’s lab.